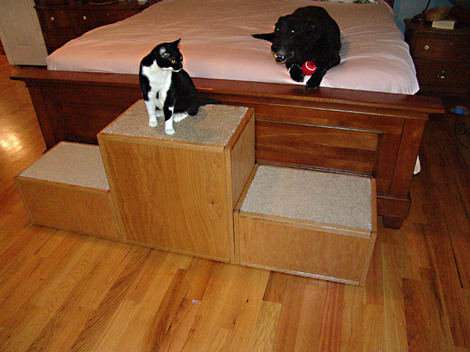 I delivered these custom dog steps today to a client today and we ran a test with Solly, the oldest dog of a group of four. With a little help from his owner, Solly was able to overcome his reluctance and managed to climb up the stairs and on to the bed without incident. Like many older critters, he was uncomfortable with new things, even if they were meant to help him out. On the other hand, he was even less happy with the fact that the cat, Queen Braveheart, took to the new steps immediately and acted like they were built specially for her. The look on Solly’s face is priceless. It is sheer curmudgeon. It is sort of misleading because he is a gentle old dog and a pleasure to be around. I am sure that this old dog will get the hang of the steps eventually, if the cat lets him use them. They are both very fortunate to have an owner who shows so much care for her pets. UPDATE: According to Solly’s owner, he is now using the dog steps without assistance. The dog step installation has met its objective. When she woke up this morning, Solly had gotten up on the bed by himself. Another small victory for the aged and infirm. This entry was posted in Affordable Designs Wood. Bookmark the permalink.